Enthralled by the Magic Within is a large-scale mural on the side of the former MiLady Cleaners by artist Heidi Clinite. The mural is a project of the Façade Squad, a local group which works to improve the facades of local buildings and in public spaces. 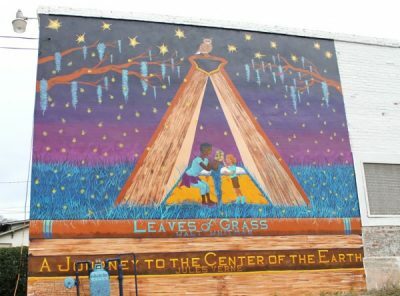 The mural was funded by a Knight Neighborhood Challenge grant, which the group received to improve the veneer of the empty building. For Clinite, this is the largest project of her burgeoning career as a muralist. A classically-trained viola player, she began pursuing visual art seriously less than a decade ago. Her paintings have been featured in several galleries in Macon. Other murals she has painted include a triptych on canvas for the Centenary Bicycle Program (also a Knight Neighborhood Challenge project) and an indoor mural at Cherry Street Cycles in downtown Macon. Known for her use of surrealist technique, Clinite places her subjects in a tent, which is also an open book. The ground beneath them is a stack of books, notably “Leaves of Grass” by Walt Whitman sits just below the children’s feet. At the bottom of the mural is Jules Verne’s “Journey to the Center of the Earth.” Clinite uses the stacks of books to evoke the layers of the earth. She seems to be saying that the natural wonder of luminescent insects and the wonders found on the pages of books are much like her paintings, meant to inspire the imaginations of us all. “The painting is a celebration of curiosity, imagination and the pursuit of knowledge,” says Clinite. Based on her preliminary mock-up , one can assume this mural will stir the imaginations and curiosity of the College Hill community for years to come.